In this latest installment from Frogdice, they take a tried-and-true puzzle concept and add to it by throwing in some magic and incorporating city management, which makes for a unique experience. Building on the Bejeweled match-three (or more) system, your rune combinations send out a magical onslaught against invaders that slowly walk towards your castle walls as they try to destroy your defenses, thus ending the stage. Making a vertical match sends out a wave that attacks a spread of three lanes, whereas a horizontal match sends out a row of attacks that hits multiple targets in the same lane. Complete a series of waves of monsters, and you advance to the next stage until you reach a boss fight. The boards that hold your runes come in a variety of shapes and sizes, each with its own challenges. Not only is the game a puzzle game—it has some elements of city management as well. Between each stage, or battle, you are brought back to your town, which requires some administrative attention. While you’re off fighting, the citizenry either get themselves into trouble or quibble over disputes of various kinds and need your help in deciding what to do. Depending on the nature of your decisions over time, you may receive bonuses in the playfield. The proud town of Mikoville. 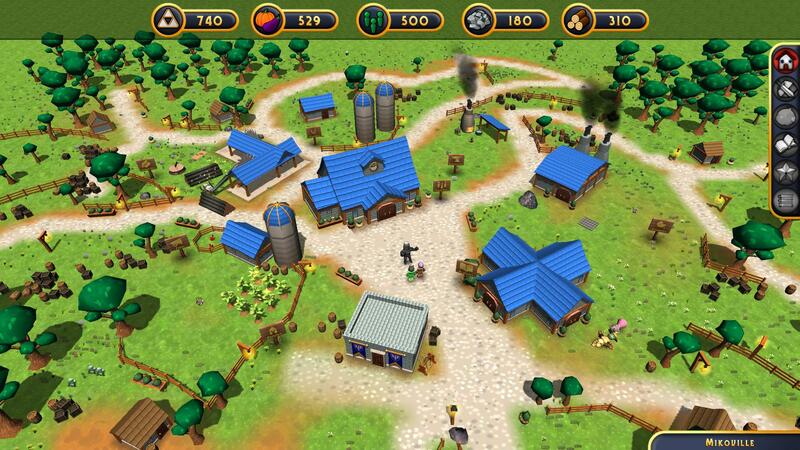 The city also includes such areas as a farm, lumber mill, granary, and others to gather resources. You use these resources to build or research items that aid you while defending your towers such as explosives, weapons, and offensive and defensive magic. These items are key for the more difficult stages where there is wave after wave of attacking mobs, and there would be no way you could stop the sheer amount of monsters by using the runes of the puzzle alone. Using your spells to their maximum efficiency and saving them for just the right moment is fun and rewarding when you take out a number of foes in one blast. While ReignMaker is a fun game, it isn’t without a few flaws. One of the issues I had was that when starting the game, you’re dropped into your mostly vacant city and told to build a few things. At this point you don’t truly understand why and say, “Okay, I guess I’ll build a farm. That sounds like a good thing. Lumber mill? Sure! I have money!” While there were some pop-ups describing some of the concepts to me, I didn’t feel like I actually understood the game without some trial and error on my part after playing a few rounds. That in itself isn’t necessarily a bad thing, and once I did get it, it was an easy concept; however, I felt as though I fell into it and didn’t actually learn it. Some additional guidance on the benefits of using items would have been beneficial as well. I almost stopped playing the game out of frustration somewhere after the first boss because stages were getting too difficult. After a series of defeats, I turned off the game, only coming back hours later after telling myself, “There must be something I’m missing or forgetting.” Sure enough, I was right. With a bit more experimentation, I discovered that the frustration I felt was related to the fact that there were a number of situations in which there was no way I could make a match in the lane that a monster was using, and no amount of clearing runes was helping me. It turns out that I could craft a dagger that allowed me, as the player, to attack a particular monster. Later on, I figured out that some magic allows me to destroy a single rune which helps against tricky, out-of-the way monsters, and other magic helps me to restore the hit points of my castle. These flaws, though, are minor. 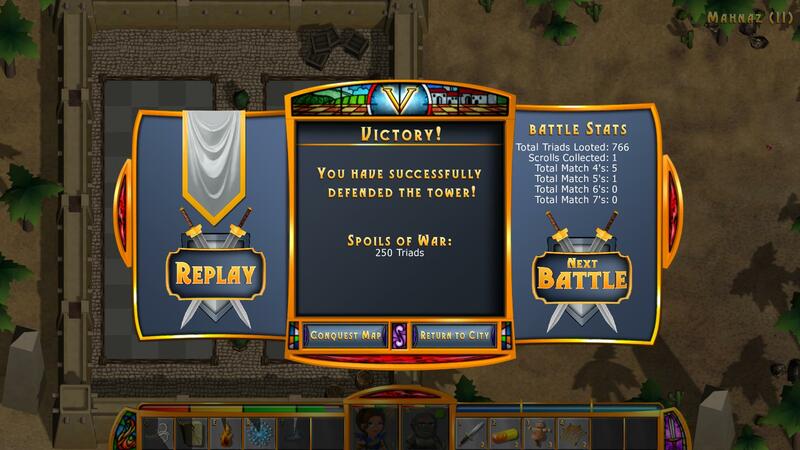 ReignMaker is a genuinely fun experience you shouldn’t miss if you are a fan of the genre. Frogdice has proven once again that they know how to make a well-crafted puzzle game. 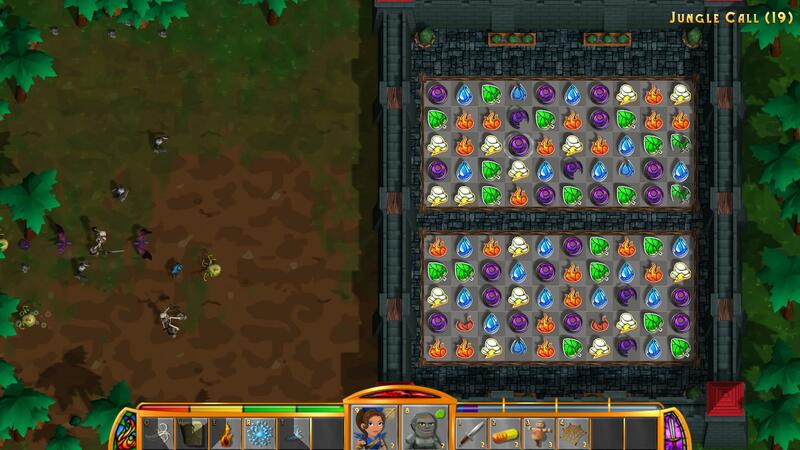 ReignMaker was developed by Frogdice Games. $15 is all it costs to have your own kingdom these days. It’s a pretty good deal for a game to play on a reigny day. OH COME ON! That’s comedy gold! Hey, don’t walk away. Come back! ALWAYS! Some people just do not get it.